We are pleased to announce that Power BI has integrated with Azure ExpressRoute. This means that companies using Power BI will be able to use ExpressRoute to establish a private, managed connection to Power BI. Additionally, we already have serveral improvements to recently released features like row-level security and Analyze with Excel. ExpressRoute is an Azure service that lets you create private connections between Azure datacenters and your on-premises infrastructure, or create private connections between Azure datacenters and your colocation environment. Now with Power BI and ExpressRoute, you can create a private network connection from your organization to Power BI (or using an ISP’s colocation facility), bypassing the Internet to better secure your sensitive data and connections. ExpressRoute delivers the benefits of the public cloud, while surpassing the network reliability and privacy of the Internet. It is a great option for companies that require premium, managed connectivity for their productivity services. You can define all aspects of your network connectivity provider’s connection from Microsoft to your users, helping ensure predictable network performance and availability. You can also use multiple ExpressRoute providers to establish ExpressRoute circuits in different geographic locations for additional redundancy and geo-resiliency. You can learn more in the Power BI and ExpressRoute documentation. In the last blog we announced a preview of Row-Level Security, and this week we're announcing our first update of RLS: support for organizational content packs. With this change, if RLS is defined for those dashboards and reports that are distributed as part of a content pack, then the security rules will be respected for all instantiated content packs. This change improves this method of distributing your content by ensuring that your security rules are kept intact. Previously, we released a video tile that supports YouTube videos. These video tiles allow you to customize your dashboard and add a bit of personal or corporate flair. Now the video tile supports Vimeo videos too. 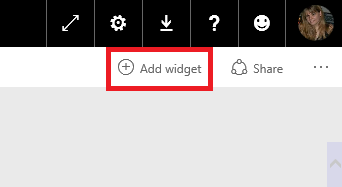 Add a video tile by selecting Add widget from the top right of the dashboard. Select the Video option and then Next. Enter a Vimeo URL in the Video URL text field and select Apply. Now the tile displays the Vimeo video. 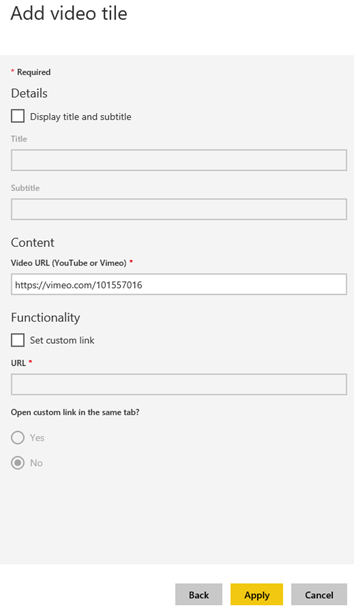 Note that Vimeo URLs come in several different formats, for example https://vimeo.com/originals/lumia/101557016 and https://player.vimeo.com/video/101557016. We support most, but not all of these formats. If the URL you've entered doesn’t work, try one of the alternate URLs for that video; the video ID-style URLs tend to work best. In our example above the video ID is 101557016, so try https://vimeo.com/101557016. Last blog, we announced that now you can analyze your datasets in Excel. 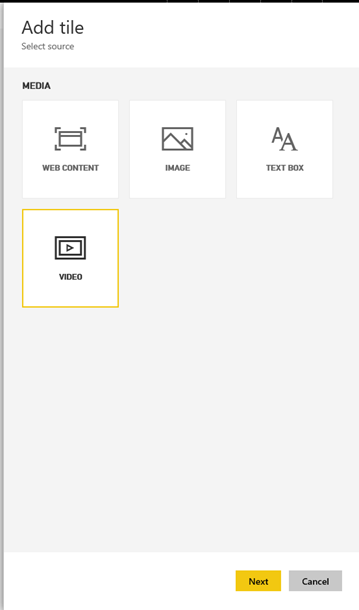 This powerful feature lets you connect your Power BI data model to Excel and create PivotTables and PivotCharts with that data. This means your data models are no longer restricted to Power BI, and now this feature is available to all users, free and Pro. Now users with multiple Power BI user accounts will have a better experience when authenticating to Power BI from Excel. Enter the credentials for the account that has the workspace where the dataset is located. If you accidently entered in the credentials for a different account, you will get a sign-in failure message and a chance to try signing in again. 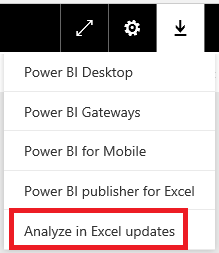 To take advantage of this update, make sure the install the latest Analyze in Excel updates. You can find them under the download menu option. That’s all for this month! We hope that you enjoy this new update and continue sending us valuable feedback about our product. Please don’t forget to vote for other features that you would like to see in the Power BI service in the future.